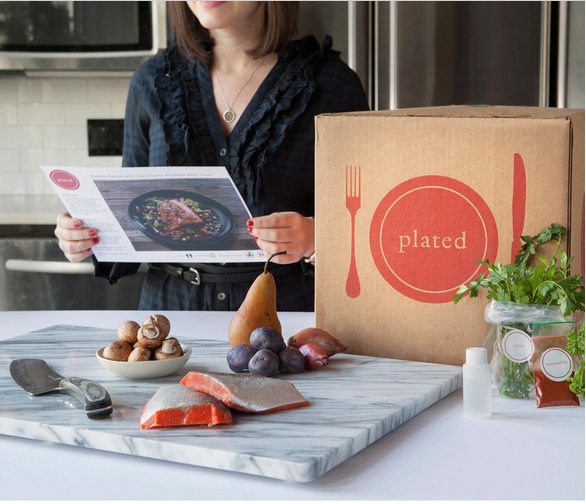 New York-based startup Plated has raised $5 million in a Series A to expand their dinner delivery system. According to Crunchbase, the round was led by ff Venture Capital with participation from Lerer Ventures, Founder Collective, and Great Oaks Venture Capital. ff Venture Capital and Founder Collective both participated in the company’s $1.4 million seed round last year. Plated also participated in the Techstars New York 2013 class. Founded in 2012 by Nick Taranto and Josh Hix, Plated doesn’t just send you a box of food. Each week the site offers 7 chef-designed recipes. Pick your recipe(s), and Plated ships to you on your region’s delivery day. All food is as locally sourced as possible, so some recipes vary by region. When you get your box, the ingredients are ready to go with recipe cards that outline the cooking process. Users can order as many or as few recipes as they’d like each week. You can buy a la carte, for $15 a plate, or join for a monthly fee plus $12 a plate. When you select a recipe, the page tells you what will come in your box, what you need to have at home, and what pots/pans you need to use. It also alerts you to any potential allergies or intolerances. The beauty of Plated is that it provides fresh, sustainable food, but it also seeks to teach people how to cook. But, if you’re already a pro in the kitchen, the recipes sent right to your door take some of the pressure out of experimenting with new things. For busy founders and entrepreneurs who want to stay healthy, Plated offers the option–at least a few nights a week. At the moment Plated already delivers to 80% of the continental US. (I was ecstatic to see it delivers in Nashville! The husband will be so excited to see something besides alfredo on our next date night.) While current plans for the capital weren’t announced, you can imagine continued expansion in delivery locations is in the works. Plated isn’t the only New York startup delivering dinner in a box. In-town rival Blue Apron has raised $8 million and offers a similar service via a weekly subscription model. The Series A brings Plated’s total funds raised to $7 million. The “Must-Attend Conference for Entrepreneurs” Everywhere Else Tennessee is headed back to Memphis this Spring. We’re releasing the first 50 tickets for 50% off exclusively to our newsletter subscribers on Jan 13th. Don’t miss your shot by signing up here!